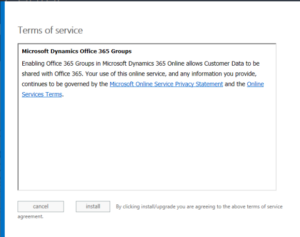 Getting Started with Office 365 Groups (Dynamics CRM/Dynamics 365 for Enterprise) - Dynamic Enterprise Technologies, Inc. In a nutshell, they can be seen as an excellent vehicle for bringing together the diverse range of features available as part of your Office 365 subscription. What helps further is that they are tightly integrated as part of the tools that you likely already use each day – for example, they can be accessed and worked with from the Outlook desktop client on and Web Access (OWA) portal. Given that this feature is a very Office 365 centric component, the natural question emerges as to why an exam for Dynamics CRM/Dynamics 365 for Enterprise (CRM/D365E) would want to test your knowledge of them. Since the release of Dynamics CRM 2016 Update 1, you now have the option of integrating Office 365 Groups with the application, to provide a mechanism for easily working with groups from within the CRM/D365E web interface, effectively providing a “bridge” for non-CRM/D365E users who are using Office 365. You may be wondering if it is possible to enable additional entities for use with Office 365 Groups. At the time of writing, only the system entities recorded above and custom entities can be used with Office 365 Groups. For this example, the Auto Create button is left blank. I would recommend that this setting is always used, so as to prevent the creation of unnecessary Office 365 Groups, that may get named incorrectly as a consequence (you’ll see why this has the potential to occur in a few moments). Just because the group is linked up with CRM/D365E doesn’t mean that you have to be a user from this application to access the group. This is one of the great things about utilising Office 365 Groups with CRM/D365E, as standard Office 365 users can join and work with the group without issue. The only thing you have to remember is that the Office 365 user has to have the appropriate license on Office 365 – as indicated by Microsoft, any subscription that gives a user an Exchange Online mailbox and SharePoint Online access will suffice. Remember that the Conversations, Notebook and Documents features are not in any way linked with the equivalent CRM/D365E feature. For example, any Conversation threads will not appear within the Social Pane as an activity; you will need to navigate to the Office 365 Group page to view these. Office 365 Groups present a natural choice when working as part of large-scale teams or projects – especially when they are internally based. They can also be a good fit for when you wish to liaise with 3rd party organisations, thanks to the ability to grant Guest access to external accounts. 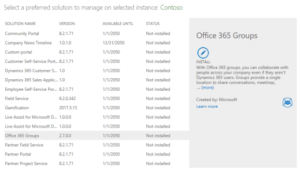 Having the ability to then tie these groups back within CRM/D365E is useful, but I do wonder whether they are a good match for all of the record types that Microsoft suggests in the list above. Certainly, Account records are a justifiable fit if you are working with an organisation to deliver continuous services or multiple projects. I doubt highly, however, that you want to go to the trouble of creating a shared document repository for a new Lead record right from the bat – particularly if your CRM/D365E deployment is more focused towards B2C selling. 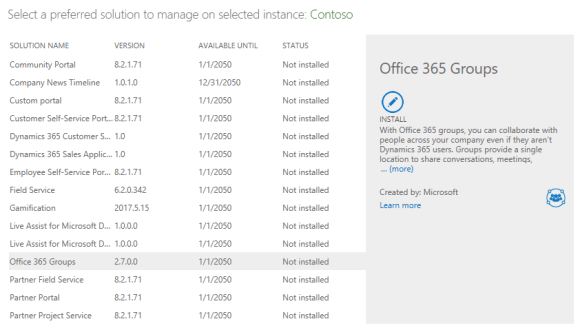 You may be tempted to over-excitedly roll out Office 365 Groups carte blanche across your CRM/D365E deployment, but I would caution against this. Don’t forget that the creation of a new Office 365 Group will result in additional overhead when managing your Exchange Online mailbox lists and SharePoint sites, as well as having long-term storage implications for the latter. Acting prudently, you can identify a good business case for enabling specific entities for use with Office 365 Groups and ensure that you manage your entire Office 365 deployment in the most effective manner possible.